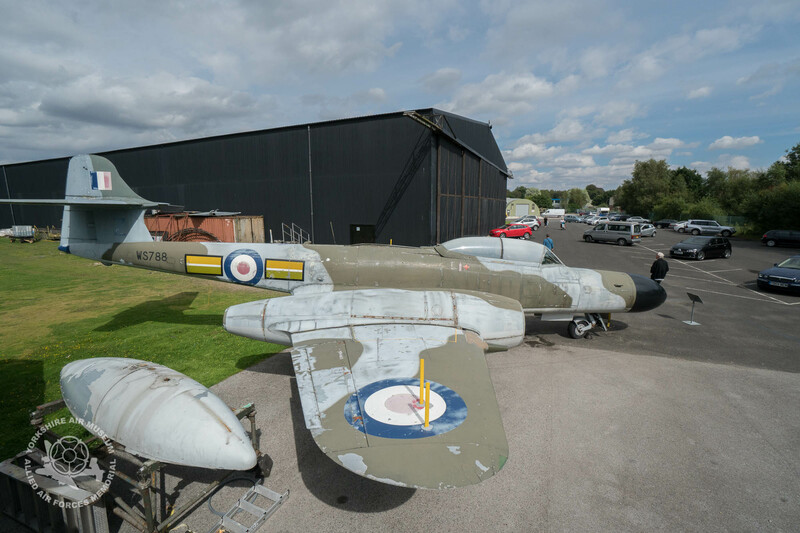 In the far corner of the Museum, to the rear of the car park, are a small collection of aircraft parked in a group. They may appear at first glance to be rather scruffy and indeed, they are not the shiniest of our exhibits. But far from being a ‘boneyard’ area, this part of the museum is home to aircraft awaiting their turn at restoration. Here’s an update on one project that has been gathering attention recently. Our Meteor night fighter / navigation trainer, WS788. Built in 1953, she flew in various roles until being retired in 1966. Like many aircraft at the time, she was then passed around, scavenged for spares before being put on display as a ‘gate guardian’ at various air bases. Eventually the Meteor found her way to us in the late 1980’s. Time and the Yorkshire winters took their toll on her and she eventually began to look rather sad, so in late 2015 a team led by museum volunteer Graham Buckle was formed to do something about the Meteor before it became too late. Graham has worked as a volunteer at the Museum for several years as part of the Victor team. He was looking for a fresh challenge, so senior engineer Grant Sparks suggested he took a look around the Meteor. He was hooked. Together with fellow volunteers Ali Mellor and Rich Woods, they investigated Meteor WS788. Nine months into this project, Meteor WS788 is slowly starting to look better. “The obvious temptation is to start doing something about the paintwork, but while that may give the appearance of progress, it can wait. Now that the wings are mounted again, we can set about replacing the control runners and get the ailerons working again. Also, there’s no point in painting her when we are still doing mechanical work as it would become scuffed too easily”. The Meteor team can be found working at the Museum on various days. If you’re visiting and you see them working on Meteor WS788, say hello. They’ll be able to tell you what the latest progress is on this old, early generation jet.